Mangaluru, July 11, 2016: A team of ballistic experts from the Forensic Science Laboratory, Madiwala, visited Vinayaka Lodge in Madikeri, where Deputy Superintendent of Police M.K. Ganapathy was found hanging. They recreated the scene of crime and the sequence of events. The team has recovered the service weapon of the officer, and also examined the bed, which bore two bullet marks. “The scene was recreated at the hotel room to see from where the bullets could have been possibly fired towards the bed. 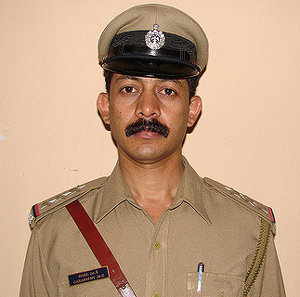 One of the theories is that Ganapathy fired his weapon as a reflex action during strangulation. This could be verified using ballistic techniques, depending on how the bullets have hit the bed, the pressure and the distance,” a source said. The team is also likely to submit a report on the sound during firing and whether it could have gone unheard in the building, an official said. The ballistic team is yet to submit its report to the CID. CID sleuths have now come up with another angle that Ganapathy was allegedly taking treatment for depression for over two years at a multispecialty hospital in Bengaluru under the pseudonym Manjunath. “His brother knew about this. Ganapathy seems to have taken treatment under a pseudonym to hide his medical condition from the department, which if recorded, could have denied him an executive posting. We will question the doctor at the hospital if he will identify Ganapathy,” a senior CID sleuth said. See the reward for the sincerity. The police care trying to secure the corrupt politician.